Research on the reliability and validity of assessment centers (ACs) has been ongoing for at least 50 years and continues to this day. The assessment center method is a technique or process that is used to assess individual performance and potential. One of the most heavily researched topics over the last 30 years has been the internal structure of AC ratings that assessors make on rating dimensions after the completion of each exercise. This volume, with contributions from experts from around the world, looks at Dimension-Based Assessment Centers, Task-Based Assessment Centers, and Mixed-Model Assessment Centers. All three perspectives are presented in different sections, and a summary of these diverse perspectives is given at the end of the book. Part One: A Context for Assessment Centers. What Are Assessment Centers And How Can They Enhance Organizations, Nigel Povah and Lucy Povah. One History of the Assessment Center, Scott Highhouse and Kevin P. Nolan. Methods and Data Analysis for Assessment Centers, David J. Woehr, John P. Meriac and Mark C. Bowler. Core Debates in Assessment Center Research: Dimensions ‘versus’ Exercises, Filip Lievens and Neil Christiansen. Part Two: Dimension-Based Assessment Centers. Dimension-Based Assessment Centers: Theoretical Perspectives, Winfred Arthur, Jr. How to Apply a Dimension-Based Assessment Center, Paul G. W. Jansen. Research Into Dimension-Based Assessment Centers, George C. Thornton III and Deborah E. Rupp. Part Three: Task-Based Assessment Centers. 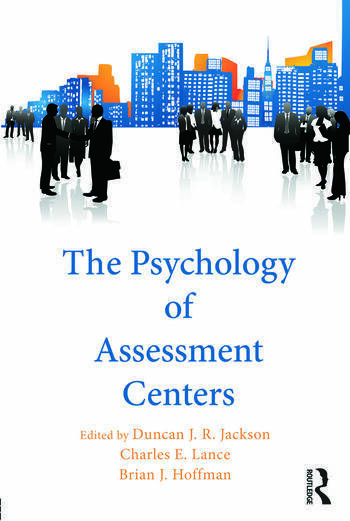 Task-Based Assessment Centers: Theoretical Perspectives, Duncan J. R. Jackson. How to Design and Implement a Task-Based Assessment Center, Carl J. Thoresen and Joseph D. Thoresen. Research into Task-Based Assessment Centers, Charles E. Lance. Part Four: Mixed-Model Assessment Centers. Dimensions AND Exercises: Theoretical Background of Mixed-Model Assessment Centers, Klaus G. Melchers, Andreja Wirz and Martin Kleinmann. How to Apply a Mixed-Model Assessment Center, Jurgen Bank, Sarah Brock, Anuradha Ramesh and Joy Hazucha. Exercises, Dimensions, and the Great Battle of Lilliput: Evidence for a Mixed Model Interpretation of AC Performance, Brian J. Hoffman. Part Five: A Summary of Three Perspectives on Assessment Centers. Dimensions, Tasks, and Mixed Models: An Analysis of Three Diverse Perspectives on Assessment Centers, Walter C. Borman.